The Hag by Credenda Studios! 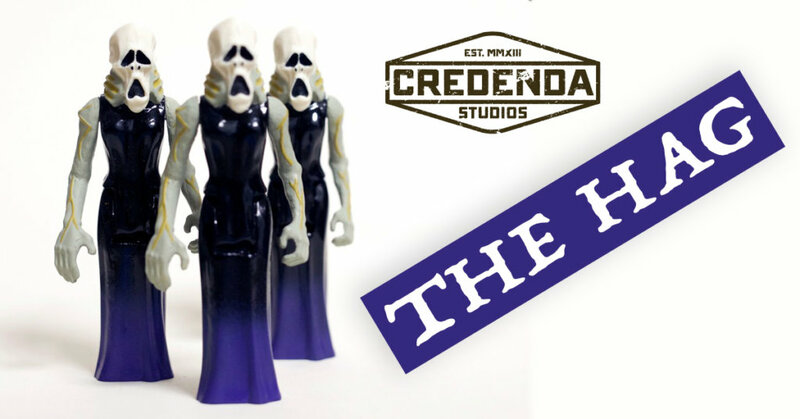 Released yesterday from Credenda Studios is THE HAG! This wizened old beast is ready to join you on your adventure & collection. Once she was celebrated for defeating the gods of the underworld and ruling with an iron fist. People offered sacrifices to her in hopes of being reunited with their lost ones. But a new foe has emerged and has taken her place. Now after years of wondering through purgatory, her triumphs have become myth and she is only referred to as The Hag. For now she patiently waits for her chance to strike back and regain her rightful place upon the thrown. However all those beware because any who lays eyes upon her will turn to dust and your soul will be with her forever, thus making her all the more powerful. She is The Hag! Only for the low price of $30 (£23) plus shipping. Each figure comes hand casted and painted by Credenda Studios and sealed in a clear bag with a custom cutout header card. Limited to only 10 figures, so get them while they last! You can purchase HERE. You can find Credenda Studios on Instagram HERE.